Thanks for your interest in Save Your Breath. We have some bonus content for you and would love for you to have them straight away. If you have any question or comments please go to the contact page to connect with me. TAKE ACTION NOW AND FILL IN THE FORM . . . 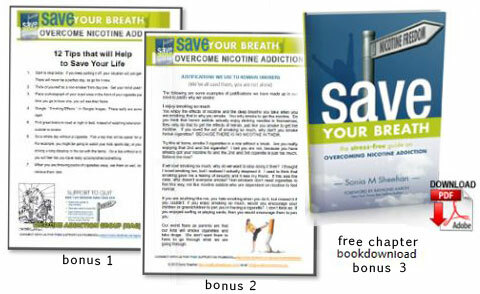 I would like to give you a free chapter of my book Save Your Breath PLUS the two other awesome PDF’s created especially to help you today. Enter your details in the form below, confirm your email and you will be directed to a bonus download page where you can access the free chapter and other bonuses! © 2013 Nicotine Addiction – A stress free guide to quit smoking. Sonia Sheehan.